98 percent of Californians served by a public water system receive drinking water that meets all federal and state drinking water standards according to the State Water Resources Control Board’s Safe Drinking Water Plan for California (June 2015). In the Sacramento Valley (the northern part of the Great Central Valley), farmers, ranchers and refuge managers are working hard and doing their part to ensure safe drinking water for all of California. This includes working with the Central Valley Regional Water Quality Control Board and its various regulatory programs to protect drinking water beneficial uses (generally known as MUN or domestic). 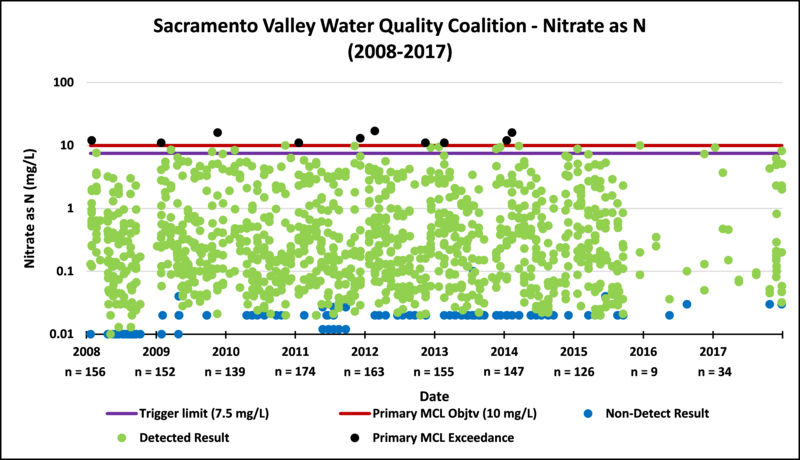 With the state’s focus on nitrates, the Sacramento Valley Water Quality Coalition (Coalition) carefully monitors surface water quality–the results for the 2017 monitoring year (October 2016 to September 2017) at 17 sampling sites once again show no nitrate exceedances of water quality objectives. All of the samples were below the 10 mg/L water quality objective, which is set to protect the drinking water beneficial use. 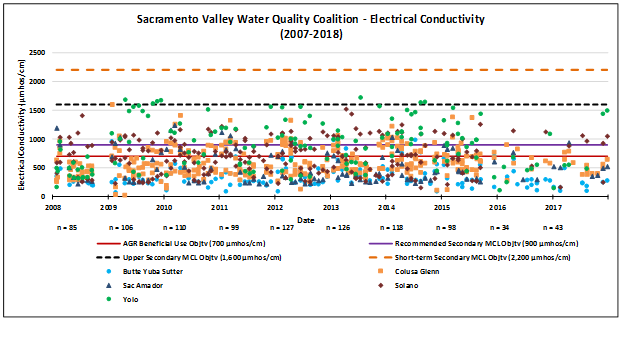 These results are consistent with the findings of the CV-SALTS Basin Plan Amendment, which states nitrate concentrations in surface water were well below the primary MCL of 10 mg/L (NO3-N) within the Sacramento Valley, as shown above for the past decade. For groundwater, the reconnaissance maps below were prepared for the CV-SALTS program and show low levels of nitrates in most of the Sacramento Valley, with a few pockets where it appears that nitrate has exceeded 10 mg/l. As part of the new Waste Discharge Requirement (WDR) for the Irrigated Lands Program, the Coalition will be further analyzing these areas and then developing strategies to address any areas with concentrated nitrates. For salinity, water quality is also good in the Sacramento Valley with few salt impaired areas. (Draft Staff Report CV-SALTS (March 2018) Page 10). The State Water Resources Control Board (State Water Board) in Resolution No. 88‐63, “Sources of Drinking Water” policy, stated that surface and ground water with a TDS less than 3,000 mg/L (5,000 µmhos/cm EC) is suitable for drinking water (municipal or domestic) water supply. From a historical perspective, the Coalition has compiled a decade of water quality results. 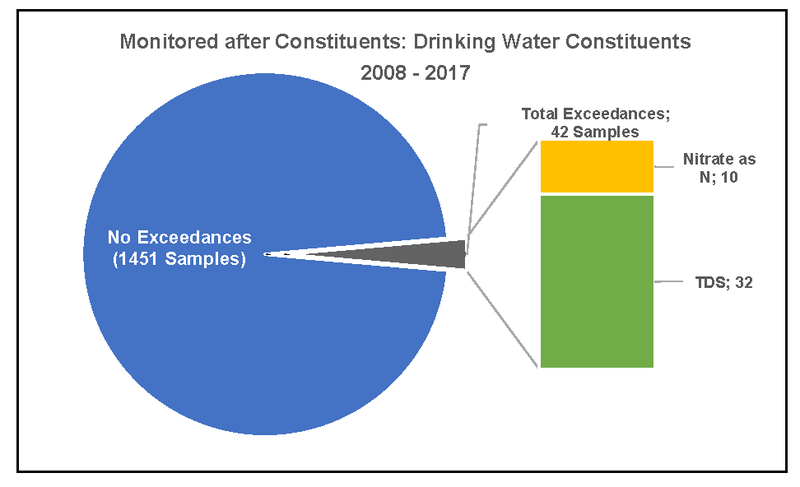 As the chart below shows, the Coalition’s 139 storm and irrigation season surface water quality monitoring results from the beginning of the program in January 2005 are well below levels required for drinking water. Additionally, as part of the CV-SALTS Basin Plan Amendment, the Regional Board completed a water quality analysis of existing surface water quality conditions to support the Antidegradation Analysis completed for the Salt and Nitrate Management Plan (SNMP). 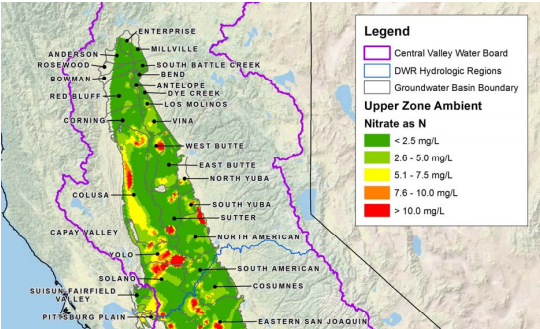 The technical analysis found that surface waters in the Sacramento River Hydrologic region have low salt concentrations and human health concerns associated with salinity‐related compounds are minimal. Surface waters within the Sacramento Valley consistently have total EC concentrations less than 1,000 μS/cm. (Final SNMP for Central Valley Water Board Consideration: December 2016, Section 3, Page 52). In general, the northern reaches of the Sacramento River have very low salt concentrations and as the water travels south through the valley, contact with natural salts in the soil, as well as agricultural and other anthropogenic activities, elevate salt and nitrate concentrations. 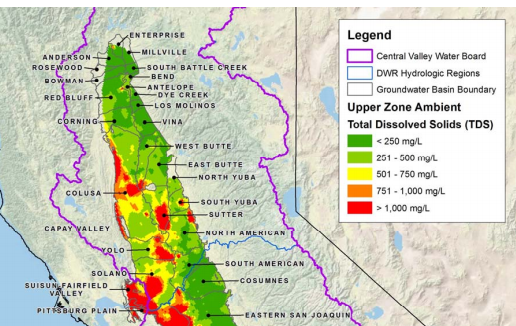 For groundwater, like nitrates, there are low levels of salts in most of the Sacramento Valley, with a few pockets where it appears that TDS has exceeded 1000 mg/l (see map below). As part of the new Waste Discharge Requirement (WDR) for the Irrigated Lands Program, the Coalition will be further analyzing these areas and then developing strategies to address these areas. The Sacramento Valley, through the California Rice Commission and Sacramento Valley Water Quality Coalition, are implementing Waste Discharge Requirements (WDRs) as part of the Irrigated Lands Regulatory Program and Basin Plan Amendment. These programs, which cover nearly 2 million irrigated acres, have and will continue to improve water quality in the region. More specifically, these programs meet water quality requirements for the protection of surface and groundwater used for drinking water. Looking to the future, these programs will also help implement the state’s antidegradation policy on agricultural lands to assure that safe and clean water is fully protected in the Sacramento Valley in the future. Similarly, urban agencies with permits will also be addressing the antidegradation policy. For any questions, please call Bruce Houdesheldt at 916.442.8333.